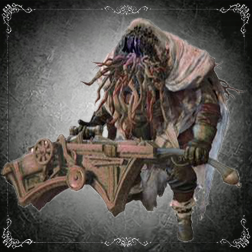 These Nightmare Executioners are much less aggressive than their axe-wielding counterparts, but their ability to strike distant targets with heavy munitions still poses a considerable threat. At long range they will level their Church Cannons directly at their mark and launch explosive cannonballs that create large fire-elemental explosions wherever they land; at short to mid range they will fire at the ground in front of them to create a forward area attack. The splash damage generated by each detonation is cumulative with a direct hit from the projectile in much the same way as the player-obtainable version of this weapon, meaning that being caught on the edge of a blast is far less lethal than taking a explosive cannonballs straight to the face. These enemies use the same tentacle grab attack as the axe type, but do not use the axe variant's Cosmic Explosion and therefore cannot augment their attacks with the same dangerous effects. The cannoneers will, however, use their artillery as makeshift melee weapons at close range, performing slow individual swings and combos of up to three hits. Their super armor can be easily broken using the Fists of Gratia, the Beast Roar or Cannon shots, but doing so is much less vital than with the axe type due to this version's more passive fighting style and simpler attack patterns. Quickstep forward through their cannon shots and bring them into melee range, then either bait and interrupt their attacks or quickstep forward through the swings and strike from behind. Set them up by moving in close to trigger their three-hit combo and immedately quickstepping backward out of reach when they initiate it - the first attack will miss and leave them open to being interrupted when they begin the second or third. Another good opportunity to interrupt these opponents is when they perform their grab attack, and they are slow enough that a well-calculated charged strike can stagger them from behind. When they level their cannons straight at you, quickstep forward through the shot and move in close; when they aim downward at the ground, quickstep backward twice if positioned at mid range or forward twice past them to avoid the blast. Note that they will use their ground blast in an attempt to drive you out of their blind spots; the tracking on these close shots is quite strong and precise timing is required to dodge the explosion by quickstepping past them. Additionally, beware of splash damage in these situations - the residual flames reach slightly behind the Executioner and can clip you even if you successfully avoid the initial explosion. Slow poison offers weaker players a marginally safer strategic alternative, but is still far from efficient for those capable of dealing reasonable damage with ordinary physical attacks. During Nightmare Executioner (Church Cannon) grab attack animation, damage can NOT be reduced by repeatedly pressing buttons (mashing). Despite Nightmare Executioner (Church Cannon) having 999 Rapid Poison resistance it is still vulnerable to such status. Ranged Cannonball No Quickstep forward through it at least twice as soon as possible after they level their launchers. Close Cannonball No Quickstep backward at mid range or forward past them at close range and avoid standing too close until the blast dissipates. Bludgeon Combo Yes Strafe or quickstep backward depending on their distance from you and interrupt the second or third swing.